The head of the North Atlantic Treaty Organization warned the U.S. Congress on Wednesday of the threat posed by "a more assertive Russia" to the alliance, including its violations of the Intermediate-range Nuclear Forces Treaty. "NATO has no intention of deploying land-based nuclear missiles in Europe," NATO Secretary-General Jens Stoltenberg said. "But NATO will always take the necessary steps to provide credible and effective deterrence." Stoltenberg dedicated a chunk of his speech to Russia, saying that even if dialogue with Moscow improved, it will still be a "difficult relationship." He defended the U.S. withdrawal from the Intermediate Range Nuclear Forces Treaty, saying Moscow was in violation. "I continue to call on Russia to return to compliance with the INF Treaty," he said. The head of NATO is using an unprecedented address to Congress, marking 70 years since the alliance's founding charter was signed in Washington, to make a pitch for unity at a time of trans-Atlantic tension. 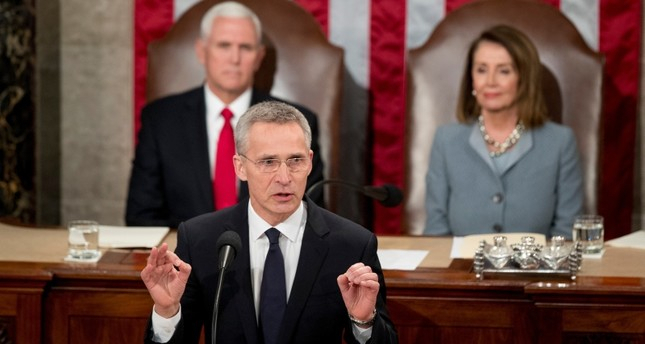 Stoltenberg, speaking in the House of Representatives, planned to emphasize the historic bonds that have enabled the United States and its European partners to preserve peace. That security partnership has come under strain, however, from President Donald Trump's questioning of the value of NATO. Stoltenberg, a two-time prime minister of Norway, is the first head of NATO to address a joint meeting of Congress. In a meeting at the White House, Trump and Stoltenberg had kind words for one another. But in the past, Trump has called NATO "obsolete" and suggested he might pull the U.S. out of the alliance if member nations didn't significantly boost their defense spending. Trump took credit for the increased spending. However, spending by the 29 NATO countries, which dropped after the end of the Cold War, has actually been rising since 2014 - before Trump took office . Stoltenberg has said that the 2% guideline was not invented by the United States and was a target the 29 allies set in 2014.